Pictured are Greenville Middle School student and We Are the Majority member Rheagan Wykes (left) and Recovery and Wellness Centers of Midwest Ohio Prevention Specialist Kelly Harrison. 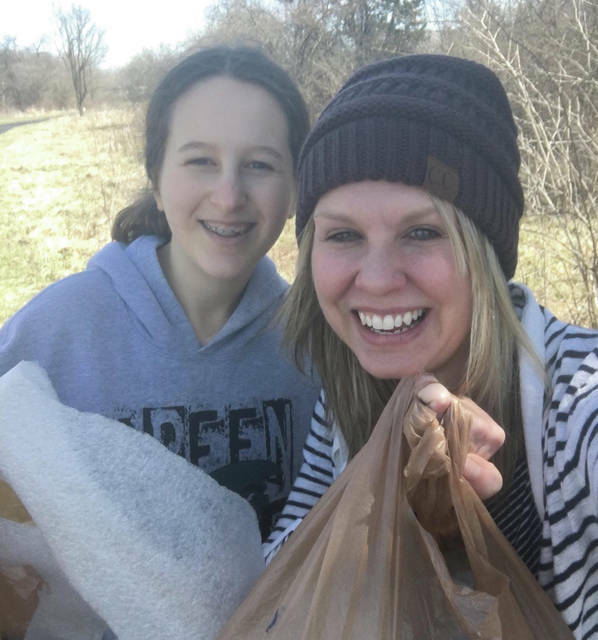 GREENVILLE — Members of Darke County We Are the Majority are encouraging local youth and other members of the community to take part in a Global Day of Service. Kelly Harrison, prevention specialist at Recovery and Wellness Centers of Midwest Ohio, helped organize the Darke County chapter of We Are the Majority, an after-school leadership program open to high school and middle school students throughout the county that encourages young people to live drug, alcohol and tobacco-free lives. The group has chapters at Tri-Village, Greenville, Franklin Monroe, Versailles, Ansonia and Mississinawa Valley schools. According to Harrison, the Global Day of Service is about encouraging people to take action in their community. The weekend of April 12 and 13, volunteers will rake leaves, pick up trash, mulch play areas in local parks and plant flowers in front of businesses downtown, among other activities. Though groups of volunteers will be supervised by We Are the Majority teen leaders and Darke County Recovery and Wellness staff members, the hope is that many more local residents will make time to take part in the event. A kick-off event will be held at 3 p.m. Friday at Recovery and Wellness, which is located at 600 Walnut St. in Greenville. There volunteers can stock up on water, trash bags, gardening tools and other equipment. Groups taking part in the event include the City of Greenville, Citizens for Safer Streets, Gateway Youth Center and Continental Carbonic. Flory’s Landscaping will donate a tree to be placed along Greenville’s bike path. The event is funded by a grant from Serve Ohio with matching funds provided by Coalition for a Healthy Darke County. Any student who is drug and alcohol-free is able to participate in We Are the Majority, which is based on an initiative by former Ohio Gov. John Kasich. The driving focus of the program is to promote the fact that the majority of students are not abusers of alcohol or illegal drugs. Those interested in learning more about We Are the Majority, or about resources for battling drug addiction in Darke County, may contact Recovery and Wellness Centers of Midwest Ohio at 937-423-3423. This entry was tagged Ansonia, Citizens for Safer Streets, City of Greenville, Coalition for a Healthy Darke County, Continental Carbonic, Darke County Recovery and Wellness, Darke County We Are the Majority, Flory’s Landscaping, Franklin Monroe, Gateway Youth Center, Global Day of Service, Greenville, Mississinawa Valley, Recovery and Wellness Centers of Midwest Ohio, Serve Ohio, Tri-Village, Versailles, We Are the Majority. Bookmark the permalink.